It is probably one of the least known and used features of iOS on iPad. It is very simple to use, yet very powerful. As time goes by and the amount of Apps, appointments, contacts and information in general increases on the tablet, many people struggle finding what they are looking for. If you own a Mac, you might be familiar with a search utility called Spotlight. The good news is that Spotlight is also available on your iPad. Spotlight is great because it searches through your reminders, emails, messages, contacts, Apps, music, calendar (events), notes and the Internet (provided you are connected). Ever been scrolling through iPad pages trying to find that App you downloaded 2 weeks ago? Not sure when that doctor’s appointment is? Let Spotlight help you find the things you need on your iPad. 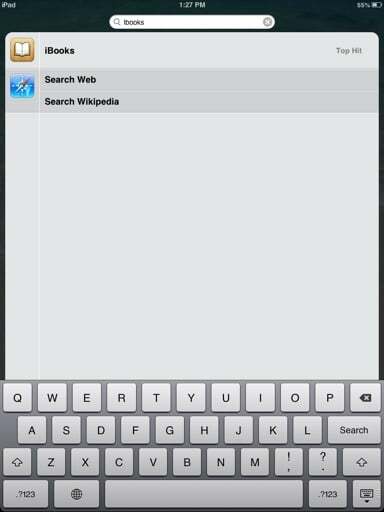 Today I will be discussing the Spotlight search utility on iPad and will complement it with a brief video. To access Spotlight, from your Home screen, swipe to the right. Another way would be from the Home screen to click on the Home button. 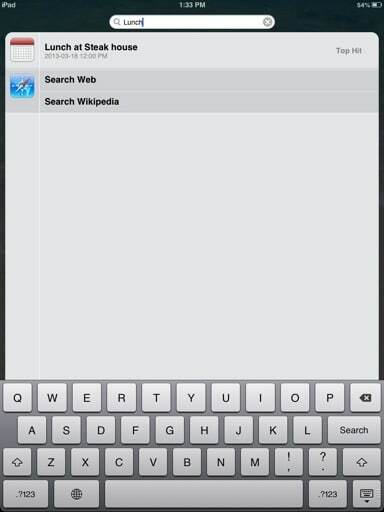 Now, I will show you a few search examples to give you an idea of how Spotlight works. Let’s imagine you are looking for the iBooks App. You don’t want to loose time scrolling pages to get to the icon. You can simply type iBooks on Spotlight. When the App appears in the results, just tap on it to open. What?! The iBooks App does not show on your results? Maybe the App is not installed. 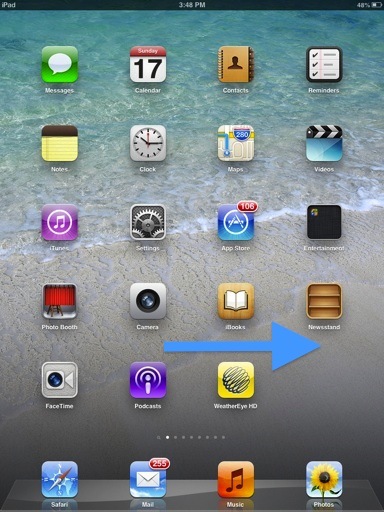 Check how to download and install iPad Apps if you want to download it. You have a lunch appointment with a friend. You know you marked it down on your iPad Calendar, but you can’t remember when it is. You can go to your Calendar App and search for it, or if you remember the title of the appointment, you can search for it on Spotlight. In this case, I’m searching for the word lunch. Once you find what you are looking for, just tap on it. You have some friends over and you want to play them a song you recently downloaded from iTunes. Again, simple and easy, just type the song name and tap on the result. The Music App will open and your song will begin to play. In this example, I’m searching for the song Good Time. Did you find Spotlight useful for you? Please let me know by posting a comment below.